For the realistic look of wood and tile without the high cost, Luxury Vinyl Plank & Tile may be the perfect choice for you. It’s quickly becoming the fastest growing category in the flooring industry due to its water resistance, durability and performance characteristics, and the ease of installation. Often referred to as LVT (Luxury Vinyl Tile) & LVP (Luxury Vinyl Plank), these products are quickly replacing laminate flooring, sheet vinyl flooring, real hardwood and real tile. They are a favorite in the Multi-Family Housing communities, providing an easier and quicker installation that creates a longer lasting floor. 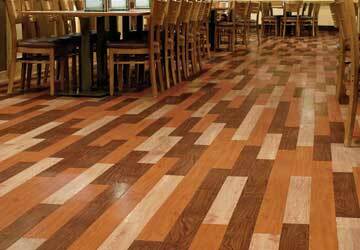 This flooring option is also extremely popular in residential homes and commercial environments. LVT/LVP flooring is designed to withstand the demands of today’s busy and active families, offices, department stores, cafeterias, and more — these products can be installed just about anywhere. There are three ways to install this product: direct glue, click together and floating, making for versatile options to meet your needs. LVP/LVT products offer many options in terms of color, appearance, texture, patterns and sizes. You can choose from hardwood looks with realistic textures, species colors and characteristics or from tile looks that are very hard to distinguish from natural stone, marble or ceramic. Certain products within the tile category are able to be grouted, making for an even more realistic looking floor without the hardness, fragility or coldness of real tile. At Keystone Floor Products, we stock a wide range of Luxury Vinyl Plank & Tile from top manufacturers, so we know that we will have what you need — and if by some chance we don’t stock it, we can get it for you. Some of the lines we offer include Shaw Floorte’, Congoleum Duraceramic, Mannington Adura TruLoc, IVC Moduleo, Nafco PermaStone, Mannington Nature’s Path, Mannington Nature’s Walk, Shaw 5th and Main, EarthWerks, Kraus Enstyle, Karndean, Metroflor, Happy Feet, Burke, Mohawk, Bliss and more.